January has not been my favorite month. I have noticed a lot of vision changes. I am having more difficulty seeing at a distance. I really noticed it this month. Driving to our home state of Ohio, from our home in Florida, I noticed that I cannot see signs on the freeway which made me nervous. The reason that we had to make the long distance drive north, in the middle of January, was that our brother in law passed away. The only positive is that he was finally rid of the cancer that had consumed his body. I got the answer from the opthamologist today. I have cataracts. I knew this was probably the case. I am disappointed that he cannot do the surgery yet. According to our insurance, I am "not quite there" and cannot get the surgery yet. I am disappointed. I want to have the surgery and restore my vision. The next appointment with him is scheduled for six months out. I hope that things do not get worse before that date. The last issue of the month. We had a flat tire this morning. We had hoped that it could possibly be patched. This is an inexpensive and effective fix. It did not happen. The hole in the tire was not at an area that could be fixed. A replacement tire had to be purchased. An expensive month with the sudden trip, the new tire and possible some uncovered medical expenses for all of the testing done with the doctor. A positive, we are fortunate that we are able to pay for all of this. Of course, not really something we want to do. Onto February, hoping for a better month. At least it is not that TERRIBLE macular degeneration ! Ah, yes, AND the tire. Isn't that old superstition that bad things come in 3s? LOVE, PEACE and BLESSINGS ! Here's to a better February! Life is full of trials and tribulations, that's for sure. Glad you see the good in that you have the ability to pay for the expenses. Hoping February will be a less-trying month for you! Blessings! Thanks for the encouragement! Spark on! Praying for God's PEACE to REST and ABIDE in your hearts. Let GO and LET God. He's THERE with YOU! His LOVE will NEVER fail you. Personally I'm having severe vision issues. BUT I've decided to PRESS forward into my dreams. That's why I write that poem every week. I also have a book series that are in edit form that I work on. Sometimes my eyes hurt so bad but I'm laughing too because of the words I've written. Persevering no matter what. GOD is GOOD to US! We have ALREADY overcome! My mom has cataracts. She can't have the surgery to get them fixed until the surgeon clears her and declares her cancer free. SO SORRY ABOUT YOUR LOSS LINDA.......... JANUARY ALWAYS SEEMS TO BE A HARD MONTH WITH CHRISTMAS JUST BEHIND US AND SPENDING MONEY WE HAVE TOUGH TIMES PAYING FOR THINGS... A LOT OF PEOPLE ARE STRESSED OUT...JANUARY IS OVER....... LOOK FORWARD TO A MUCH MORE HAPPY AND PEACEFUL FEBRUARY........ IT CAN ONLY GET BETTER. Sorry to hear of your struggles :-(( Deepest sympathies for the loss of your brother-in-law, but yes, relief from the suffering or cancer.. Eye problems are the worst. In our publicly funded system it is the same, you have to be at a certain stage. But when you do get them out, what a world of difference. My stepdad could ditch his heavy glasses for reading lenses and he saw things so much clearer. Sadly he has some kind of growth blocking his vision now that no one can figure out what it is :-(( The standard allowed tests revealed nothing useful. I feel for you Americans, how much you pay for your Health Care and wrangle with your Insurance companies. I would be homeless in short order with my medical issues there. Wishing you a more fabulous February! Sorry to hear Jan. want a good month for you. Me either. Let's hope February is a good month for bot of us! This does sound like a difficult month. I am thinking of you. Let's move on to February and better times! Linda, I have to agree with you...January was a bad month for me too. I'm sorry it was bad for you. I think February has to get better, right? I sure hope so! I know it's hard to look on the bright side, but we do our best. You are right, at least now your BIL is out of pain. And there is a treatment for your cataracts. It's too bad they can't offer you the treatment yet, of course, but it will be there for the future. I guess it gives you time to save up for the future medical bills. I wish you the best with dealing with the vision issues. And I'm glad the tire is fixed, at least. Hang in there! Your friends are here to support you however we can! Hoping February is a better month for you. so sorry January has been a hard month! I hope February is better for you! 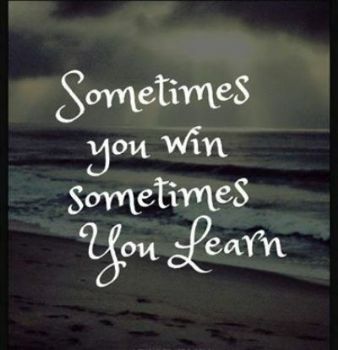 I love that "sometimes you win" quote, that's one I need to remember. Sorry to hear all the challenges you've faced this month, and praying February will be much better. That's a shame the insurance won't pay for the cataract surgery yet, especially when you are noticing such a change in vision. I am so sorry for your loss, Linda. I am praying for you my friend. You are in my heart! I am so sorry to hear of your loss. He is out of pain and in a better place now. Good luck with the cataracts and please do be careful. Praying things will get better. I'm sorry the month wasn't so great. I hope February will become a better month for you. I don't understand why insurance companies make you wait for procedures you need now. Here's hoping for a better February. It does seem like things pile up sometime. Good luck with the cataracts. I had mine removed a couple of years ago and couldn't believe the change in my vision. I don't even need glasses now except for reading. I had to give up night driving before I had mine done as I couldn't see the road after dark. Be careful until you can get yours taken care of. Those quotes are spot on! May this month be better than last! yes, hoping you have all the speed bumps out of the way and you have smooth sailing from now on. Lots of pressure for the month for you! I will pray that February treats you more genly!